Farming at Knepp has always been dictated by the heavy clay – like concrete in high summer, and the rest of the year, unfathomable porridge. For centuries, most of the land that was not covered in water, woods or thorny scrub was permanent pasture primarily for cattle. In medieval times the low Weald was renowned for its oaks (used as pannage for domesticated pigs and valuable as timber), and coppice and gorse (used as fuel for the iron industry). Many of Knepp’s fields still bear the name ‘furze’ – the local word for gorse. In 1941 Knepp was covered in scrub. Charlie's father Raymond and his two aunts stand in front of shrubs about to be pulled up as part of the Dig for Victory campaign to turn wasteland into arable. The invention of the mole plough in the mid-19th century (an ingenious device that could excavate drainage channels several feet underground) and generous grants for land drainage in the Victorian era revolutionised farming on the clay. Even so, arable crops were viable only on the best-drained fields. The ‘Dig for Victory’ campaign of the Second World War heralded the dawn of intensive farming and transformed the countryside of Britain. At Knepp, parts of the estate that had never been considered for growing crops – including the Repton park around the castle - were ploughed up for arable. Farm subsidies continued, even after the war, and, with advances in technology – chemical fertilisers, pesticides, modern machinery and new varieties of crops – Knepp continued under a regime of intensive agriculture. In 1987 Charlie Burrell, then in his early twenties, inherited the estate from his grandparents. Trained at Cirencester Agricultural College he fully expected to continue the farming tradition. But for decades the farm had been losing money, unable to compete with new, industrialised farms on better soils. Despite modernising and diversifying into ice-cream, yoghurt and sheep’s milk, in seventeen years the farm made a cash surplus in only two. In February 2000 the decision was made to sell the dairy herds and farm machinery, and put the arable out to contract – clearing the estate’s mountainous debts. The timing was fortuitous. 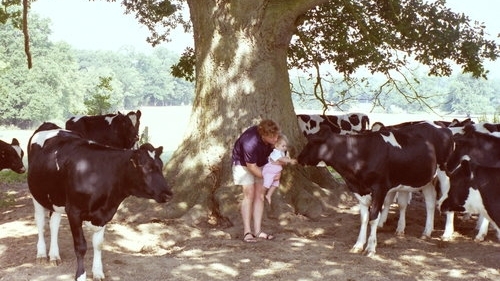 That winter, floods devastated the southeast of England, wreaking havoc on farms and livestock; and in early 2001, the price of milk quota collapsed and the UK meat and dairy industry was crippled by a year-long outbreak of foot-and-mouth.